The tank, a weapon which would revolutionize warfare, was created in France almost exactly at the same time as in Britain, to meet the same tactical need. And even before the first tanks were built, it was in France, at the turn of the 20th Century, that the very first proper machinegun car with partial armour appeared. This complete illustrated directory details numbers 100 main French armoured fighting vehicles (tanks and armoured cars) plus 285 variants (personnel carriers, bridgelayers, mine-clearing tanks etc.) 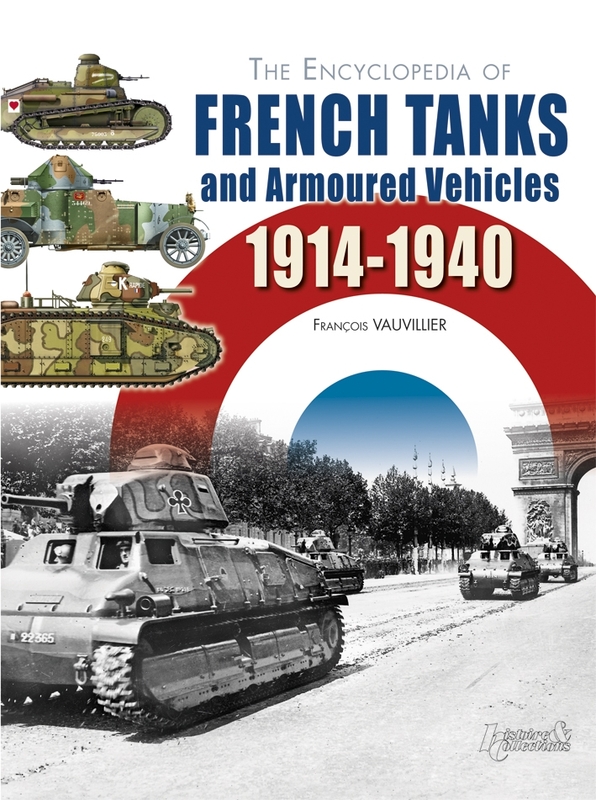 as well as prototypes and projects, offering a comprehensive coverage of all French armoured vehicles from before the Great War to the Blitzkrieg period. The text accompanying the illustrations is concise and informative, the various lines of AFV development are laid out as Genealogic Tables, data files describe in detail each main type, and this directory is richly illustrated with rare contemporary photos, plus a wealth of colour profiles published to a constant scale, together forming the ultimate reference work on the subject. Written by François Vauvillier, and translated from the French by Roger Branfill-Cook. Available from Histoire & Collections. “This magnificent book is a sumptuous collection of photographs and artwork…. The pages are informative and attractive… and while the illustrations and photographs help it along we have to give Roger Branfill-Cook praise for his translation skills because it would all come to nothing if the thing read really badly, and happily, it doesn’t.” Reviewer: Mark Barnes in War History Online.